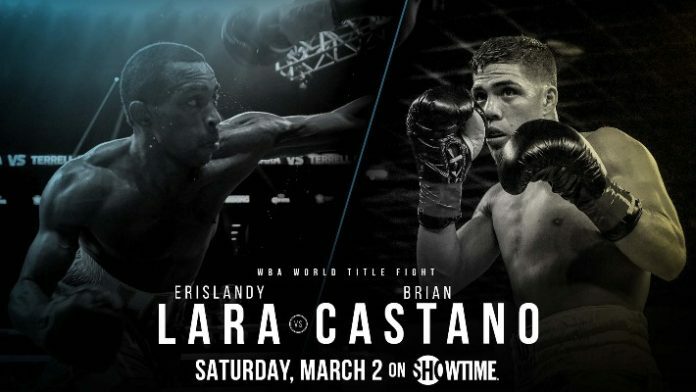 Check out MMA News' coverage of the WBA (Regular) light middleweight title match-up between Brian Castano and Erislandy Lara. Last night (Sat. March 2, 2019) WBA (Regular) junior middleweight champion Brian Castano defended his title. He faced Erislandy Lara. The action went down from the Barclays Center in Brooklyn, New York. Castano was undefeated in his boxing career with a perfect record of 15-0. He faced the 35-year-old veteran Lara, who had a record of 25-3-2. In Lara’s last bout, he had a six-fight win streak snapped by Jarrett Hurd, losing via split decision in April. Also on the card, 39-year-old heavyweight knockout artist Luis Ortiz returned. He was on a two-fight win streak since suffering his first loss to Deontay Wilder in March.